Lights lit during the festive season do make for a brighter Christmas. However, traditional light bulbs not only consume more energy, they also look jaded and old. They also become extremely hot and can cause a mishap or an accidental fire. This can happen if these bulbs come in contact with the glitter or decorative paper that you have used in your Christmas tree. To prevent mishaps from bulbs and to make your lighting bright and attractive, you can make use of light emitting diodes or LED’s as they are simply called. You will be pleasantly surprised to know that LED’s use only 10% of the electricity consumed by incandescent bulbs. As far as safety is concerned, LED’s remain cool even after long hours of operation making them much better option than the traditional bulbs. Last but not the least, the average life of a LED bulb is 50,000 hours. So you can enjoy Christmas lighting with LED lights better than anything else you have been using before. If you thought LED lights were too costly for Christmas lighting, think again as their prices have come down crashing in the last few years. If they were available only in red color only earlier, they are there in full array of colors in the market today. They are also available in many different styles and shapes such as ropes, and mini lights. There are also alluring LED candles and other innovative designs that will allow you to have a brighter Christmas this year. If you are persuaded that LED lights are simply better than incandescent bulbs, what do you propose to do with all the old Christmas lighting that you have? Are you going to throw all those old bulbs because you now feel that they are unsafe and also inefficient as far as consumption of electricity is concerned? 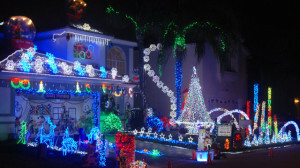 No, simply mail your old bulbs to holidayLEDs.com that will use them in a better way by recycling their individual parts. This is not all as you stand to get a coupon from the company that allows you to purchase your LED lights from them at a discount of 15%. .